Every reporter should be a frequent user of Twitter’s advanced search function. I spent some time on the phone recently with a veteran reporter wanting some help in using Twitter effectively as a reporter. I’ve published lots of Twitter tips for journalists before and compiled resources for journalists using Twitter. Those extensive lists might be a little overwhelming, though, if you’re just getting started in Twitter and lacking confidence. I’m going to take a different approach now, explaining one Twitter tip at a time, suggesting that reporters master a different tool or technique each week (or so; no promise that I’ll be able to hold to a weekly schedule). We’ll start with Twitter’s search tools. Twitter’s basic search just added some new features, and I encourage journalists to check out its new features, including the ability to search the tweets of the people you follow. But advanced search has more useful features, especially for local news reporters. Perhaps the most useful feature of advanced search is the ability to filter searches by location. 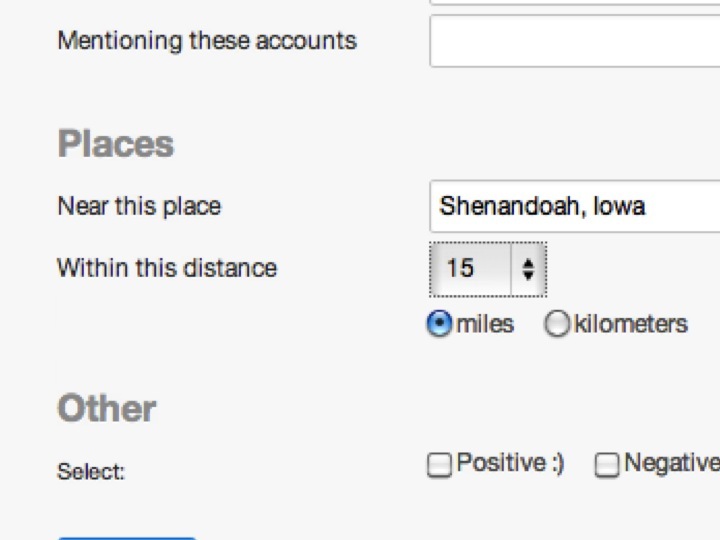 Toward the bottom of the search form is a window, that says “near this place.” When you start filling in the name of a place, a distance tool appears with a pull-down menu that lets you set a narrow or wide radius for your search: as fine as 1 kilometer or as broad as 1,000 miles. You can use this location search in a variety of ways: If you are searching for tweets about an event you are covering or a breaking news story, you can focus fairly tightly on the location and search for tweets using the event’s hashtag or using some keywords such as crash, fire or tornado. You can tweet back at the people, seeking an opportunity to interview them. Or you might curate their tweets as part of your story. They might be tweeting photos or videos that will help in your reporting or that you can curate. For instance, if I were a reporter in Shenandoah, Iowa (I was 40 years ago, but we didn’t have Twitter then), I would search for tweets about a local fire by setting the radius fairly narrowly (perhaps 5 or 10 miles if it the smoke was visible for that far) and including words like fire or smoke in the “any of these words” field. If a particular business or type of building such as a church or school were on fire, I could add the location name to the search. If I’m doing a story about a new football coach being hired for Shenandoah High school, I could set the location and search for terms such as SHS, Mustangs, football, coach and the coach’s name. Or I might search for the #Mustangs hashtag. You can also use the location search to find people from the community to follow, so you can monitor the community conversation for story ideas and sources. Many of the people you follow will follow you back, giving you more traffic to stories when you post links and giving you crowdsourcing opportunities. You will want to do some searches without the location filter, too. Location is not 100 percent reliable. If people have location turned on in their settings and are tweeting from a GPS-enabled phone, their locations should be pretty precise. Tweeting from a laptop is less accurate. And, if someone has not enabled location, the tweets will show for the location in their profile (mine would say Herndon, Va., even though I will be traveling in California this week). Some people haven’t enabled location in their settings and haven’t filled in a location in their bio, so they won’t show up in any location-filtered search. To find those people, you might include some location terms in the keywords you search for. Advanced search has other helpful features. If you are looking for people who are fans or opponents of a particular person or position, you can search for keywords (with or without the location filter). The Mashable video below shows some effective ways to focus a keyword search. You can also set the search to find positive or negative tweets. In the football coach example I used, if I had already talked to some critics of the hiring, I could search for supporters by filtering for positive tweets. You can adjust the keyword search various ways, searching for an exact phrase or a combination of words, or excluding a word. You can filter out tweets or search for hashtags or tweets mentioning a particular person. Twitter’s advanced search is highly effective in real-time search when you’re working a story people might be tweeting about. But it doesn’t search back more than about a week. Use Topsy (again, use the advanced search option) to look for older tweets (I just found a 2008 tweet quickly). If I were working on a story looking back on the Cedar Rapids flood, I could find tweets from the week of the flood by setting the dates for back to June of 2008, setting twitter.com as the domain and looking for tweets with all of the words Cedar, Rapids and flood in them. You could find more tweets by looking for all tweets during that period of a particular person who was tweeting about the flood. Suggest a topic for me to address in this series in the comments here or using the hashtag #twutorial. Two things I plan to feature in this series are examples of effective tweets by reporters and a list of reporters using Twitter effectively. Nominate tweets or reporters for either compilation using the comments here or the hashtag. Or add to my list of helpful Twitter tutorials. Good call by them to add the location from bio. Definitely a leg up on Geofeedia and iWitness, which, from what I can tell, only gather in content from folks with geotagging left on. Thanks, Steve. Very, very helpful. Thanks for the link. I don’t know whether the data cited are accurate, or whether the percentage is higher in the United States, or whether Twitter usage is high enough that 1 percent is enough on many stories but location search is highly useful for many reporters. However, this is why I suggest searching with and without the location filter. I’ve looked all over Twitter as it appears on my desktop computer and I’m not seeing the advanced search pull down menu. Where is it? Good question, Luther. That’s why I just included a link to it. It’s almost like Twitter is trying to hide it. On the Twitter.com home page, enter any search in the simple search window in the top bar. When you get your results, at the top right, you will see a little gear icon, with a pull-down arrow. That arrow will give you the advanced search option. Once you’ve used it, all you need to do is start typing “advanced” into a browser and it will be an option. Don’t know if you can see the rendered presentation but you can also visit my website at henrymlopez.com I’ve got some resources about advanced twitter searching.